Ross's Law Marketing Blog: Here's Proof that Marketing is More Important than Technology. Here's Proof that Marketing is More Important than Technology. Does she still seem as smart as you originally thought? What do you think about this firm? Are the lawyers tough? Smart? Skilled? Is this the firm that’s sure to win the bet-the-company case? What does their lobby look like? What type of building are they in? They call themselves "A top litigation defense firm." Do you believe them? What schools do you think they recruit from? Ivy League or the local city schools? Are they dynamic and creative, or are they average, dull, boring, nothing-special? Is this an A-tier firm? Or perhaps a B- or C-tier firm? Think - Do you have an opinion? I’ll bet you do. Is this firm smart or average? Strong or weak? Skilled or mediocre? Dynamic or dull? The real question is - DO YOU HAVE AN OPINION? Because if you have an opinion, then we can agree that marketing works. Because it’s the same firm, just before and after the marketing makeover. So, if you thought that one firm was better, smarter, tougher, or more skilled than the other, then you have been subconsciously influenced by its marketing. You don't know these lawyers, but you still couldn't help but have an opinion regarding their respective quality. Compare the two home pages below - see the point? Both sites work just fine, but what made the difference was the Marketing. 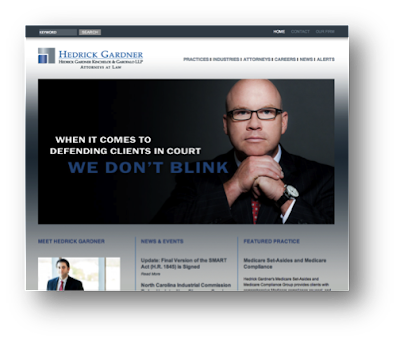 Hedrick Gardner is an outstanding litigation-oriented firm. But whatever feeling you have regarding its reputation and skill wasn't created by the technology, you were influenced by the marketing. Candidly, today, every agency offering websites to law firms provides roughly similar technology -- because we’ve all created features in response to law firm demands. 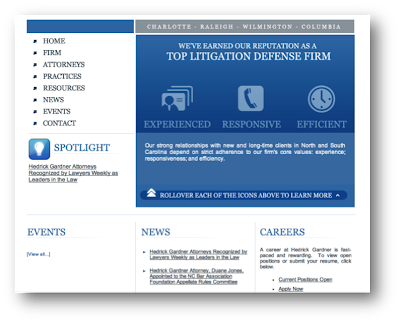 The suite of WordPress features and functionality that we’ve developed for law firms is extraordinarily comprehensive. Of course, NO client has ever said, “We’re hiring your firm because your website’s technology is superior.” However, clients routinely admit to excluding from consideration law firms whose websites convey a sense of mediocrity. That's just their perception. And perception is created by Marketing. You can see the entire marketing campaign here. Looking to upgrade your firm's image, reputation, or website? Contact Ross Fishman at Fishman Marketing today!